FlexAbility from Science Supplements is a high specification supplement that provides declared levels of key nutrients involved in cartilage synthesis and support using a unique combination and optimal levels of scientifically proven ingredients, including glucosamine, low molecular weight chondroitin, MSM, omega 3 fatty acids DHA & EPA, Hyaluronic Acid (HA) and Vitamin C. Low dust, highly palatable and tested for prohibited substances under the UFAS BETA NOPS scheme. Suitable for all horses and ponies to provide nutrient support for joints against the rigours of training and competition, can help to maintain normal mobility and joint function in older animals and for use in young animals to support normal joint health and mobility. 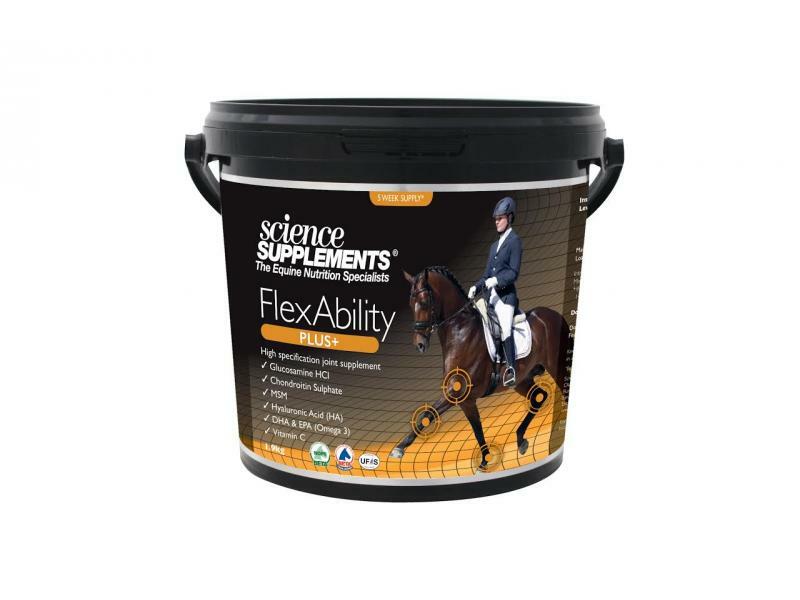 There are currently no questions for Science Supplements FlexAbility Plus for Horses - be the first to ask one!